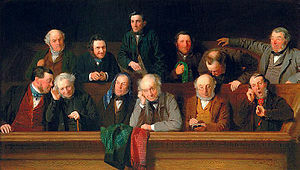 A right of jurors in all common law jurisdictions (UK, U.S., Canada, Australia, …), regardless of whether the legal system allows jurors to be made aware of it or exercise their right, is jury nullification. That is, the right of juries to find the defendant not guilty of a crime if they feel that the charge or penalty is unjust. Historical examples of the effective application of this right include U.S. jurors nullifying laws requiring escaped slaves to be returned to their “owners,” refusing to convict on prohibition charges in the U.S. during the Great Depression, and in Canada, a jury refusing to convict a father for murder, who killed his suffering daughter with cerebral palsy, arguing that it was a compassionate killing (R. v. Latimer). Given that this statement was made by the first Chief Justice of the highest court in the United States, who was recognizing a common law principle of fundamental rights and justice, it is therefore precedent, which all subsequent Supreme Courts and all lowers courts are required to uphold. The significance of jury nullification is that, in any case, a single juror can legitimately find the defendant not guilty based on the belief that the charge or penalty is unjust. I therefore propose that this right be brought out of the shadows and into the minds of the wider community, and seriously pursued as a strategy in any current and future court cases involving unconstitutional, unlawful, and unjust acts of government against its citizens.